A grand hotel bar inspired by the 19th century’s Golden Age of cocktails and fine drinking, Manhattan bar is like a theatre with an open bar as its stage where diners can watch bartenders do their magic. Fitted with luxurious furniture put together by somebody with an impeccable sense of style, the atmosphere makes one feel like he has been transported back to the 1920s, reminiscent of old New York with a glamorous yet modern touch. 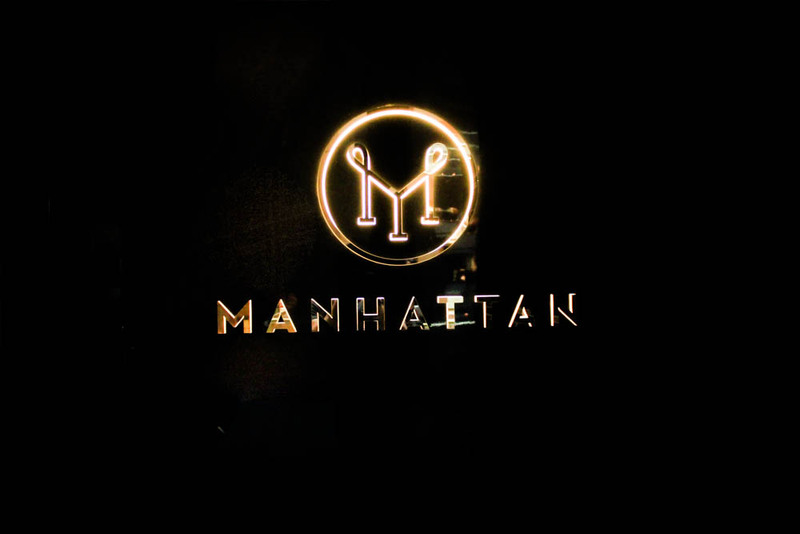 The main beverage menu will feature 25 seasonally rotating cocktails that take you on a journey through the rich history, cultures and flavours of Manhattan city’s countless intriguing neighbourhoods. 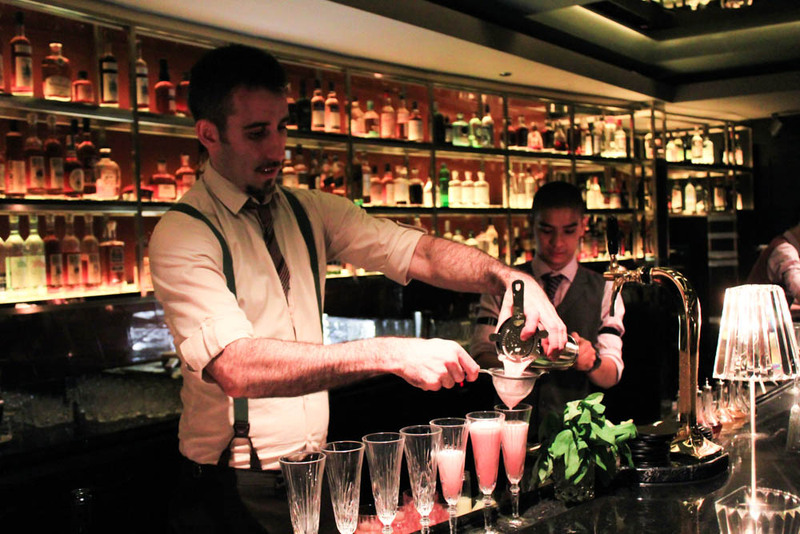 Cocktails cost between $18 – $24 ++, while bespoke ones cost $25++. The Princess Cut ($23). 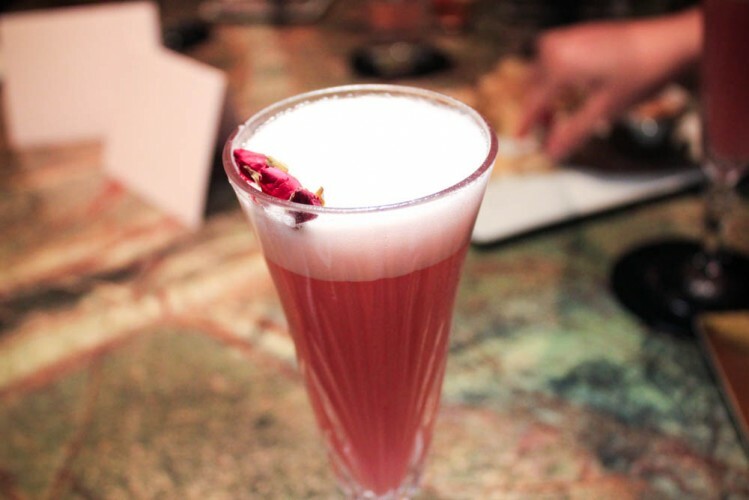 Comprising of G’Vine Floraison Gin, June Fleur de Vigne Liqueur, House-made Hibiscus Syrup, Fresh Lemon, Rosewater and Champagne, this delicate cocktail is a popular hit amongst the ladies, and isn’t shy of male patrons as well. Box Office Smash ($23). 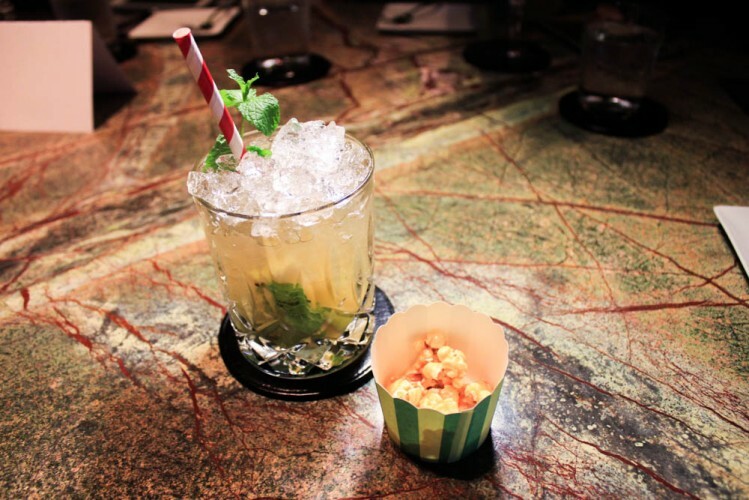 Johnny Drum Private Stock Bourbon, House-made Ginger-apple Syrup, Fresh Lemon, Organic Mint and served with a side of Salted Caramel Popcorn, this drink is a fun interpretation of the Theatre District of Manhattan. Eighth Ward ($24). 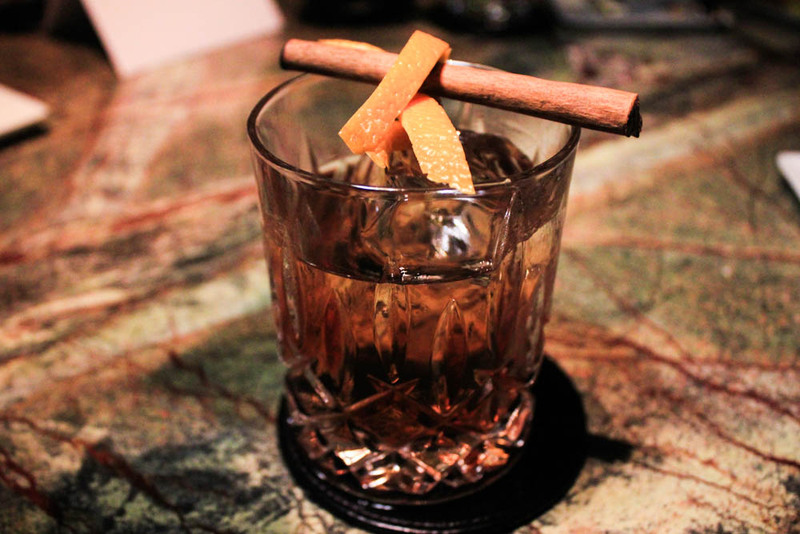 High West Campfire Whiskey, Sangue Morlacco, Cocchi Vermouth di Torino and Ferrand Dry Curaçao, this is my personal favourite. The slight zest mixed with the very round and slightly oaky flavour of the whiskey just makes me want to kick back against a fire on a cold night. The food menu features some superb dishes by head chef Nicholas Trosien as well, to compliment the inspired beverages. Maine Lobster ‘Roll’ ($26). 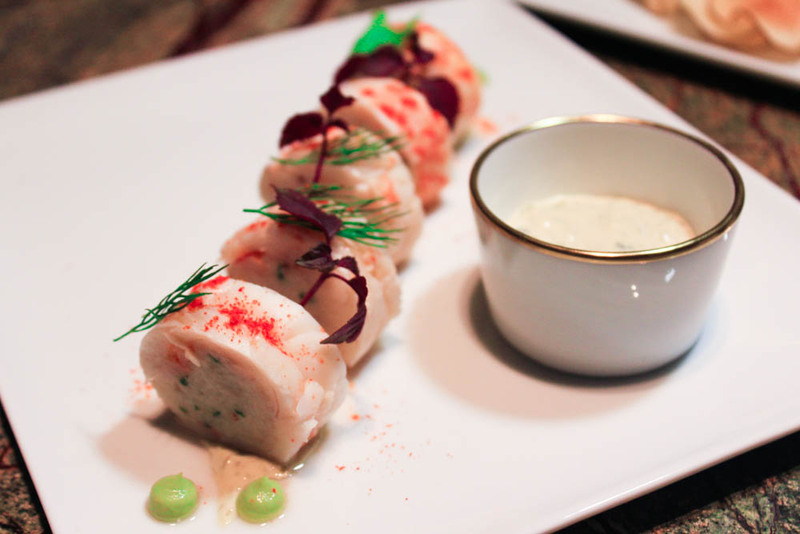 Fresh Maine lobster wrapped around a refreshing crab salad, Avocado and Remoulade Sauce. 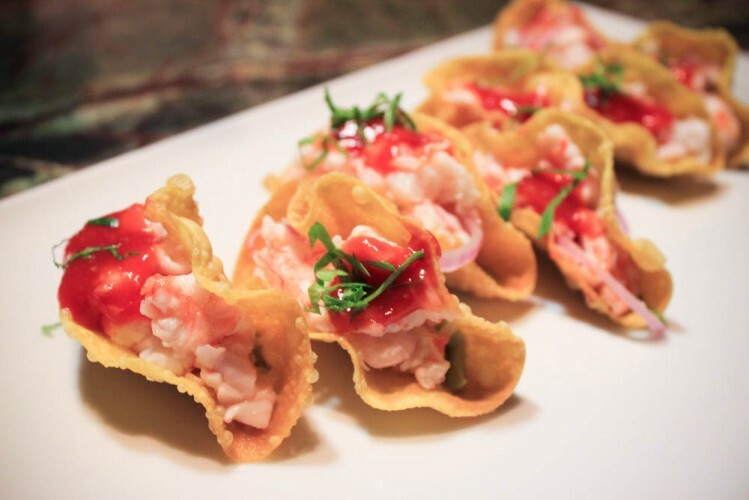 A reinvention of the typical lobster roll bun. Very tasty with generous sweet, succulent lobster instead of buns. 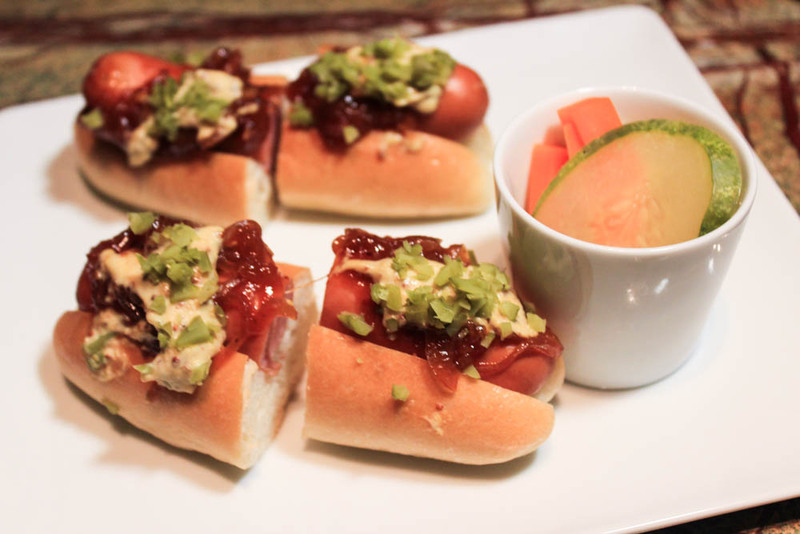 Street Style Hot Dogs ($15). Braised Tomato Onion, Pickle Relish, Knickerbocker Mustard. Don’t be fooled by its unassuming appearance, the ingredients in this simple and commonly found bar bite came together very well to result in a burst of flavour in every mouth. 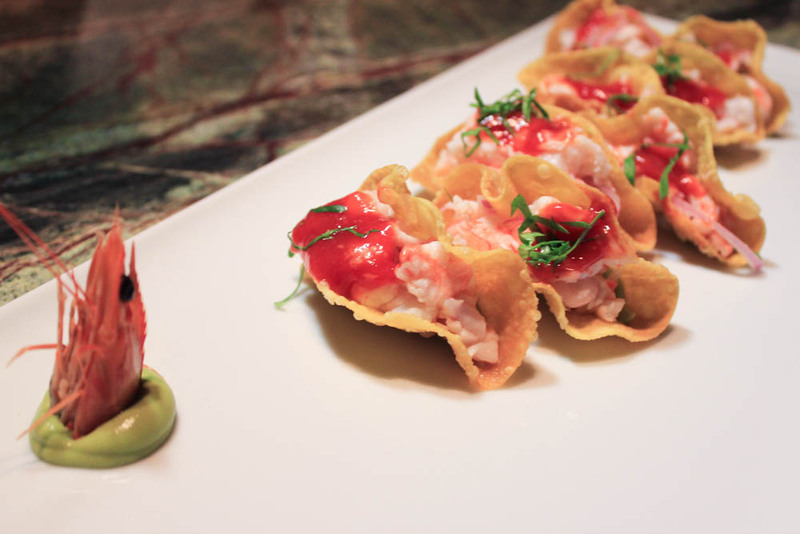 Shrimp Ceviche Taco ($20). Crispy Wanton, Bloody Mary Cocktail Sauce, Avocado and Micro Celery. Veggie/Rebellion Burger ($20). Sampling half portion. 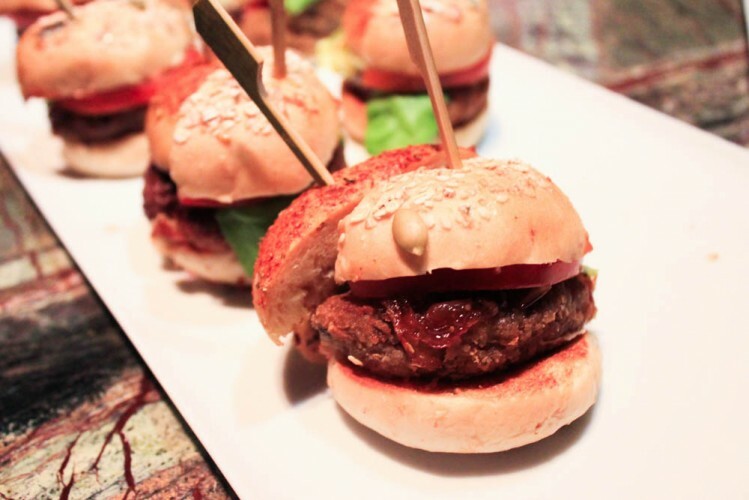 The burger half that has been sprinkled with red paprika spice is the Rebellion Burger, which consisted of Angus Beef, Paprika Bun, Tomato Onion Jam, Artisan Nicasio Cheese and Butter Lettuce. It features a home made whiskey ketchup and a custom blend of angus beef, very tender and delicious. The Veggie Burger is made up of Wheat Bun, Quinoa-lentil Patty, Caramelized Onion, Heirloom Tomato, Lettuce and Artisan Cheddar. The Big Apple Cheesecake ($10). 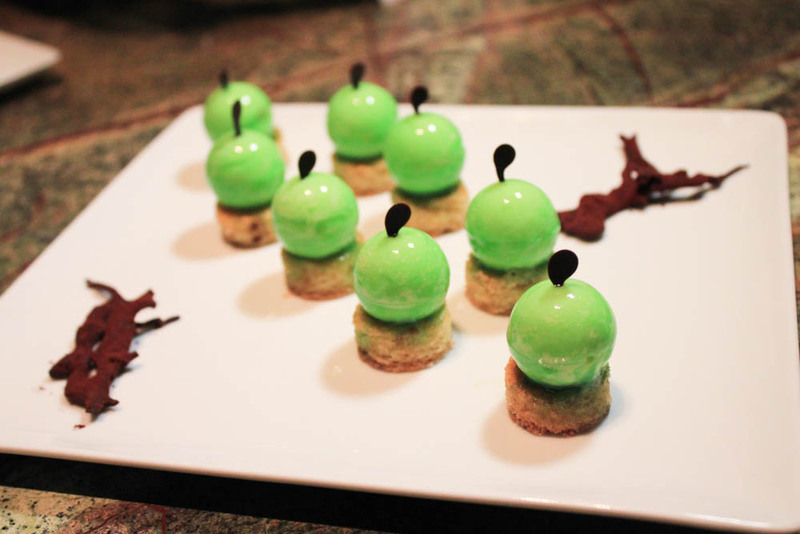 Philadelphia Cream Cheese, Vanilla Sable and Apple Essence, this dessert is every cheesecake lover’s eyecandy. Looking as good as it tastes, the cheese is wholesome and flavourful with a hint of apple, I was unresistably popping them into my mouth after the first. Head Bartender Ricky Paiva shows us his ‘rickhouse’ collection of homemade aged spirits, whiskeys and cocktails. As well as his awesome handlebar mustache. 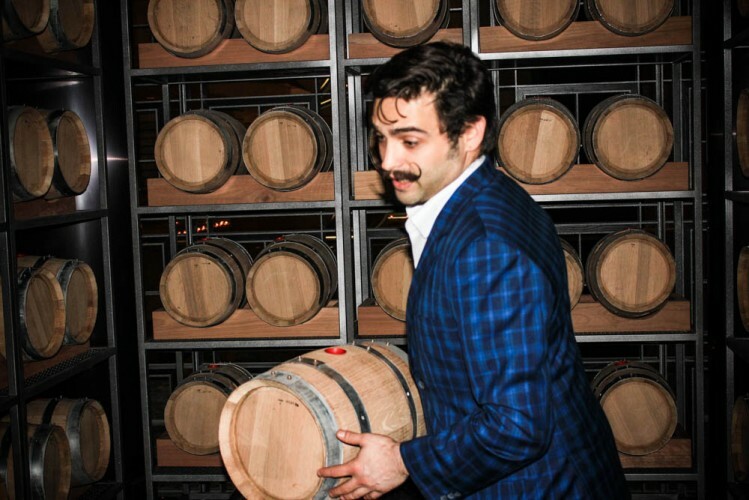 Ricky uses a technique called Solera Aging, where the spirits are stored in barrels and fractions of the contents of the oldest barrels are combined with pulls from newer barrels to create a cohesive house blend. Over time, there will be several levels within the Solera system as the spirit or cocktail is replaced with a cocktail in the second oldest cask, resulting in a blend of young and old spirits with more depth and complexity. 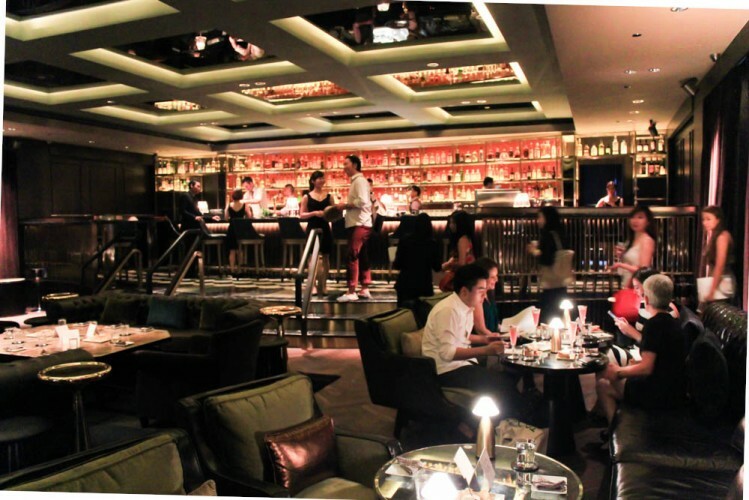 The successful infusion of old and modern borrowed from vintage New York in the entire atmosphere, food and beverages of Manhattan Bar has created a distinctive fingerprint that is uniquely its own in Singapore.